Oregon-Blount's PowerSharp bar and chain sharpens in seconds with handy clamp-on attachment. Several weeks ago we received a 16-inch PowerSharp bar and chain from the Oregon folks to try on our Stihl 025 chainsaw. One of the biggest hassles of cutting limbs and branches and firewood is the continual problem of keeping the saw chain sharp and cutting in a straight line. The PowerSharp Diamond system is a good solution to that hassle. 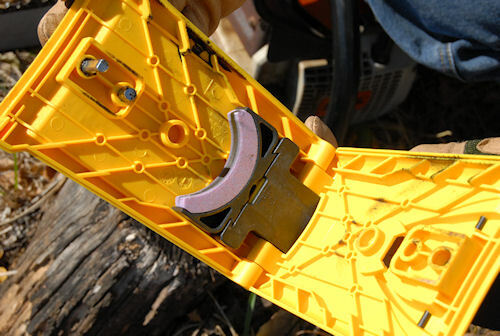 Oregon's PowerSharp attachment clamps directly onto the nose of its proprietary bar and chain to give sawyers an "on-board" sharpening attachment. Curved sharpening stone in the attachment sharpens the top-cut blade in seconds while the saw is running and the attachment is activated against a stationary object. First, the top-cut chain design, necessary to be able to sharpen it on the running saw with an exterior grind stone, is as aggressive as a starving shark, even up against oak and bois 'd arc limbs. Also, the blade is tough enough it doesn't need sharpening for extended periods – unless you get into the ground or take a chunk out of a nail or other blade eater. Once that happens, however, the PowerSharp Diamond sharpening attachment is easy to snap onto the nose of the bar – pilot holes provide easy and perfect alignment of the diamond sharpening stone. Once the attachment is secure, start the saw, run up the rpms to get the chain running, then push the spring-loaded plunger of the attachment into a secure stationary object for about a second. You'll see sparks, and by that time your blade is sharp! Turn the saw off and unsnap the attachment and you're ready to restart and resume cutting. In some older "on-board" sharpening systems we've experienced, the sharpening operation wasn't true and did an uneven job – leaving the "sharpened" chain with a pronounced "hook" to the right or left. With the PowerSharp system the blade cuts as true after sharpening as it did when it came out of the box. Eventually, however, the blade and the diamond stone wear, and Oregon recommends replacing the stone and bar and chain as a unit. The PowerSharp system is available in many big box stores and farm and ranch supply outlets at competitive prices with other chains – particularly if you consider time and retail sharpening prices of about $7 a pop.